If you are a film lover it’s almost certain you’ve come across The Criterion Collection. Established in 1984, The Criterion Collection is a video distribution company known for its amazing archive of important classics and contemporary art house cinema. They take great care in restoring film and presenting it in the best way possible. They helped to standardize the letterbox format and with their special editions regularly release extended directors’ cuts and include bonus features such as interviews, trailers, film critic commentary, in a sort of fun film school in a box. Besides of their amazing quality I love Criterion releases for their incredible cover art. 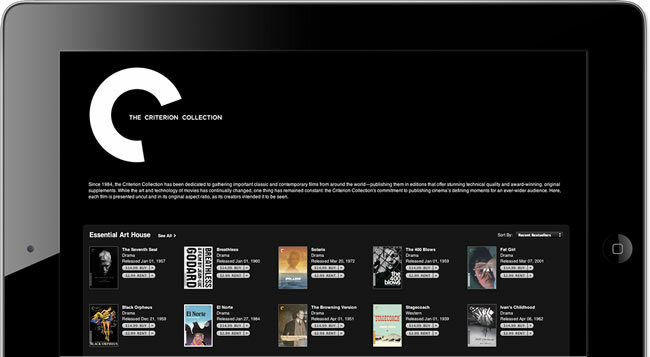 Criterion had recently began offering online viewing of its masterpieces, with 57 titles on offer, and now the company has started testing the waters with iTunes. It has made pretty much the same collection of 46 world, American Indie and art-house movies available for you to rent or buy from iTunes. Each film costs $2.99 to rent (less than the $5 Criterion demands on its own website) and $14.99 to buy. Prices aren’t surprising as Criterion usually charges high prices leveraging on the niche and quality of its flicks. Unfortunately what’s missing now from the movies on offer are the bonus features, and of course the current selection only scratches the surface of the Criterion 800+ DVD and Blu-ray collection. Hopefully Criterion will be able to leverage the iTunes Extras system and include the bonus features in the future, and of course more movies. I would definitively recommend Jean-Luc Godard’s Breathless and Black Orpheus as a starter!